Hello! Today I have a bit of a different post for you. 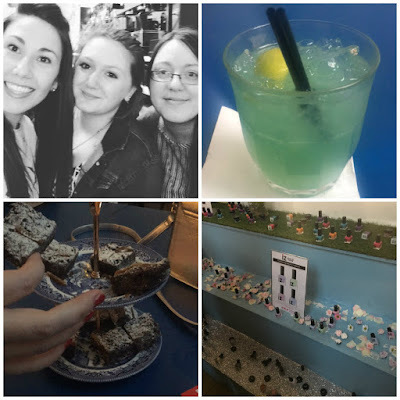 I recently attended a blogger event hosted by iZ Beauty of London and CALGEL. It was the first PR event that I have been invited to, and it was an amazing experience. 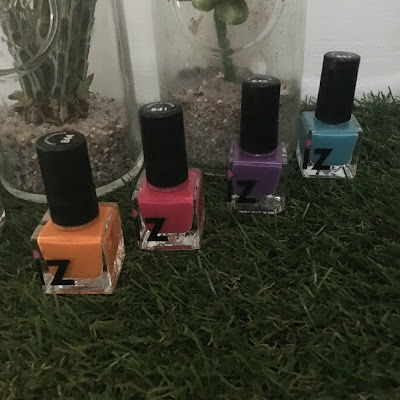 I managed to get a couple of quick pictures of iZ Beauty's spring and summer collections, which I thought I'd share. All guests were also given a box of goodies which I've since had a play with. Read on to find out more! First up, a little about the event itself. We were all treated to a night full of cocktails, brownies, popcorn, doughnut decorating, and of course, manicures. I was lucky enough to attend with two of my favourite nail ladies, Lea (@leasnails), and Kat (@klenails), and even had my mum as my plus one. As you can imagine, we had a fabulous time! Now for the polish! Here is a quick look at the iZ Beauty spring collection, Blooming Beautiful, which is actually currently available here. Here is the upcoming summer collection, Festival Fever. All four look like gorgeous bold shades. As mentioned, we all also left with a box of iZ Beauty goodies. Here's a quick look at the contents of my box - two sets of decals ('Monochrome' and 'Summer Floral and Feather'), a sheet of 'Neon Rose' nail wraps, a gel effect polish in the shade 'Peekaboo', and full size glossy topcoat. I created a quick mani with several of the items. 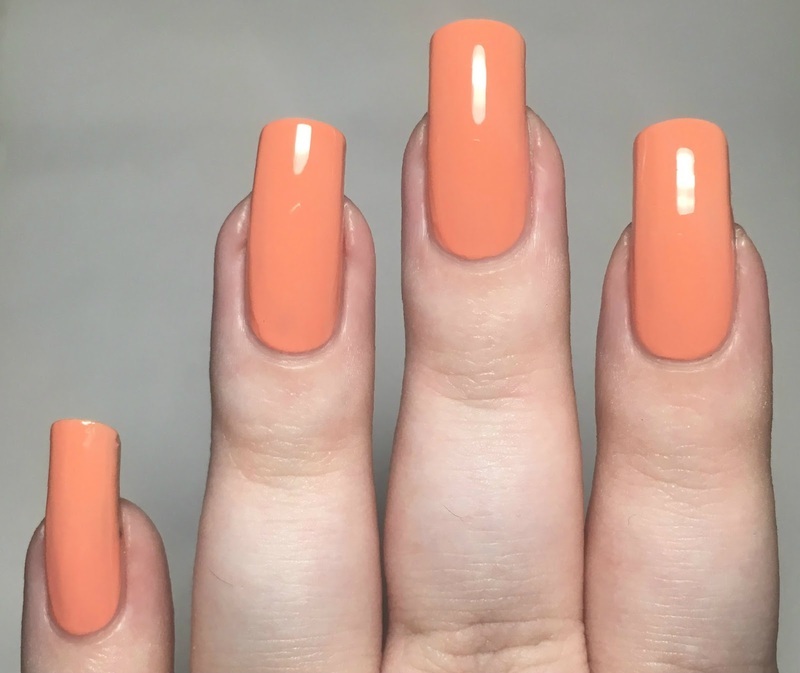 I started off with a base of 'Peekaboo', a peach creme. 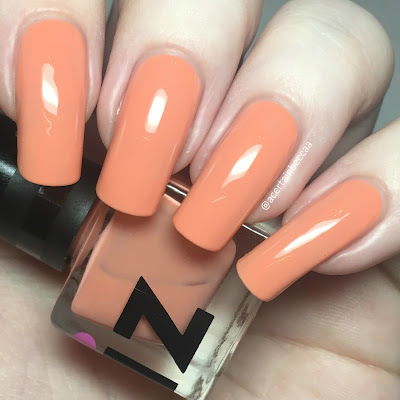 It has a smooth, easy to apply formula, being a softer shade it is a bit streaky at first. However it built up nicely, and evened out after a third coat. Below is three coats topped with the glossy topcoat. I then added some decals. The darker diamond shape pattern in the monochrome set really caught my eye. I added them down the length of my middle and index nails, and cut off a single diamond for my index and pinky nails. 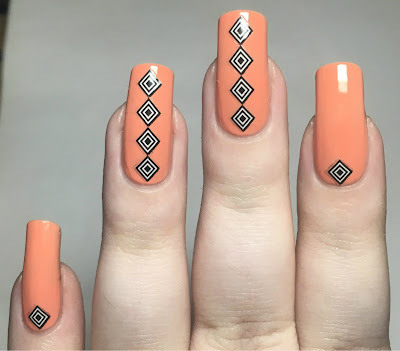 They were very easy to use - I simply peeled them off of the backing sheet and placed them onto my nails. What do you think? It was such a great night! Thank you to all of the lovely ladies and both iZ Beauty of London and Fluorescent PR for inviting me! I can't wait to have a play with more of the items in my box, or for the release of the Summer collection. Even my Mum has been impressed by the brand! You can find the iZ Beauty of London website here, and gel polish line CALGEL here. How fun! I love the look of their shades! Looks like you had a fab evening, I was sad not to go, especially as there was donuts! Love the mani Becca, it's gorgeous. How exciting! Love seeing all the photos and polish. I bet this was a great event. I haven't been to a PR party but I'd love it. Those polishes look so pretty. How fun! I've never been to a PR party, but sounds like it was amazing. I love the look you created with the decals - so sophisticated! It's always great fun to attend such events with friends. Peekaboo looks very pretty on you! I LOVE the colours from the summer Festival Fever collection!!! It sounds like that event was a lot of fun! Looks like you had so much fun! That orange is beautiful, and I love the decals you added. That orange is absolutely stunning. I am OBSESSED with the mani and the decals you added o it. Simply gorgeous! What a fun event! I've never heard of the brand but the polish you swatched is lovely! That orange is lovely by itself, but the addition of the decals takes it to a whole new level! I love that nail art! That orange is pretty and I love the decals! It seems that you had a wonderful time and as a bonus you could bring someone with you! How cool is that? I must say the nail wraps looks great (pink flowering ones for me) and your manicure with those stickers on - great! First of all your nails are beautiful! So glad you had a great time at the event. Peekaboo is a beautiful color! I am in love with the orange lacquer and black/white decals!!!! Perfect combo!! !